It is possible to rediscover hope, contentment, and joy after the death of one’s spouse. 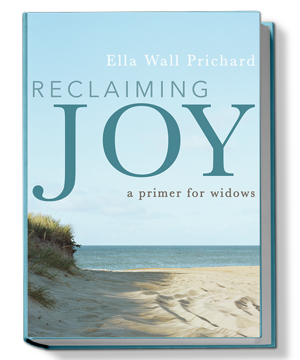 In her inspiring, encouraging, and practical new primer for widows, Ella Prichard tells how she emerged from the overwhelming cloud of grief to reclaim joy. April 7, 2019 – Speaking during worship services, 8:45 and 11 a.m., Shiloh Terrace Baptist Church, Mesquite Texas. April 10, 2019 – “The Journey to Easter Joy,” 6:15 p.m., Seventh and James Baptist Church, Waco, Texas. April 13, 2019 – “The Journey to Easter Joy,” 10:30 a.m.–12:30 p.m., women’s luncheon, Shiloh Terrace Baptist Church, Mesquite, Texas. June 13, 2019 – Presenting author at a pre-festival program and reception, 3–5 p.m., First Congregational Church, part of the Nantucket Book Festival, June 14–16. Full schedule to be announced April 1. October 3, 2019 – Keynote speaker, Self Symposium, Stark College and Seminary, Corpus Christi, Texas. A list of previous speaking engagements can be found here. Receive blog and book updates!